The Northern coast of Sicily is wonderful, especially the areas near some of our villas in Palermo and surroundings, where you will have the chance to visit some of the best beaches on the island. According to most people, Cefalù is the most beautiful beach you will find in the Palermo area. Unblemished nature, clean blue sea, a vast beach, and a pretty town full of history, restaurants, and ice-cream shops. Santa Flavia is at the foot of Mount Catalfano, near Solunto, once a Phoenician stronghold. From here you can take a boat to the Secca delle Formiche shallows, a veritable diving paradise, or bathe in the picturesque inlets of “Ai Francesi” or “Kafara”. 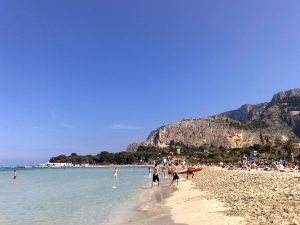 Mondello Beach is undoubtedly the most famous beach in Palermo, and also the most beautiful one close to the city center. A kilometer and a half long, it is the beach chosen by the locals. Once a swamp, it is now a beach of sparkling white sand with calm clean waters. It is crowded day and night, as it is lined with stalls and ice-cream shops and the perfect place for an evening stroll. Cala Rossa takes its name from the red rocks (rossa=red), which create an evocative view you definitely can’t miss. It is a small beach, not much frequented. Magaggiari Beach is a beach of fine golden sand with clean, transparent water, lined with excellent beach resorts and restaurants. Sferracavallo Beach is situated in a typical fishing village full of excellent fish restaurants and opens onto an emerald sea. Nearby is Punta Barcarello, a beach attached to the Capo Gallo Nature Reserve. From here you can see Isola delle Femmine, an islet 300 meters off the coast with a 16th century watchtower, now a nature reserve of the LIPU (Italian Bird Protection Association). Inside the Capo Gallo Nature Reserve you will find Cala Gallo Beach, a rocky beach overlooking a deep sea perfect for scuba diving. The seafloor here will regale you with an intense show of marine fauna, including lobsters. Addaura Beach is also very appreciated by those who enjoy diving. It follows the northern slope of Monte Pellegrino and looks out onto the Golfo di Mondello. Capaci Beach has several beach resorts and a portion of free-access beach. It is sandy and the water is shallow, making it ideal for children.